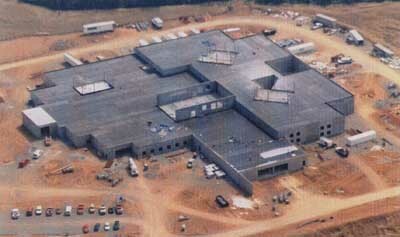 Construction on the 140,000 square foot facility began in May of 1997 on a 28 acre site located in the Dublin Industrial Park in Dublin, Va. Brown & Root Construction Company was contracted to build the facility at a cost of $28.4 million dollars with the State of Virginia sharing half of the cost associated with the construction. 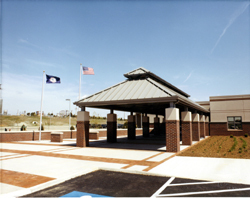 The jail was built utilizing pre-cast concrete structures that were manufactured by the Tindall Company of Petersburg, Virginia. These units were built off-site and trucked to the Dublin site. This process of using pre-cast concrete units accelerated the construction phase. The newly built regional jail housed its first prisoners on April 27, 1999. The initial inmate count after all of the local facilities were closed was 248 men and women. Since that time the inmate population has doubled and includes federal inmates as well as inmates from outside jurisdictions. The new building houses administrative offices, a magistrate’s office, public and professional visiting areas, kitchen, laundry, library, classrooms, medical unit, basketball court, two contained outdoor recreation yards, and a secure vehicle sallyport for loading and unloading prisoners. Click here to read more about the jail expansion. In 2005, the New River Valley Regional Jail Authority decided an expansion was needed due to rising incarceration rates in the localities served by the jail. The joint project between Balfour Beatty and English Construction began in March 2008. The five-story, 139,000 square ft. addition was completed in February 2010, bringing the occupancy rate to 859 beds, 1183 double-bunked.